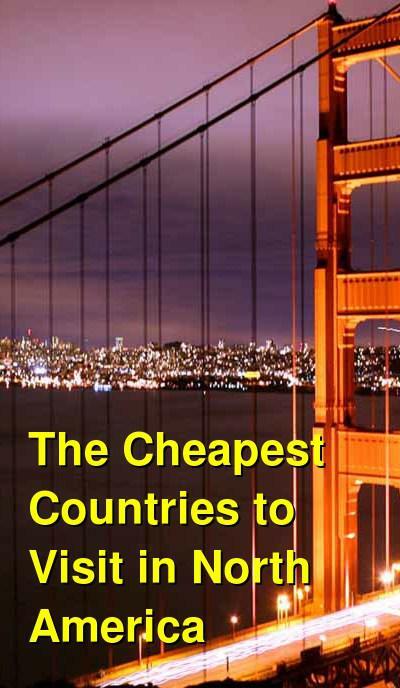 What are the cheapest and most expensive countries to visit in North America? The following travel cost rankings for countries in North America are calculated based on the travel budgets of real travelers. Also referred to as a Travel Cost Index, or a Backpacker Index, the countries below are in order from most to least expensive by their average daily travel price, per person, per day. There is such a wide range of things to see and do in North America. The United States is an incredibly diverse nation. People from all over the world immigrate here, and many of those people go on to have families of their own who are ethnically and racially diverse. Being the second biggest country in the world by area, Canada has plenty of untouched natural wonders. Much like the people in North America, the food is quite diverse. There are classic American dishes such as fried chicken, macaroni and cheese and tuna casserole, but there is also an abundance of places to find foods inspired by other countries. From science centers to historical monuments, art galleries to war memorials, you'll find a museum to explore no matter where you are in the country. Some showcase the rich, long history of the United States, while others focus on modern inventions and the future of our world. You can visit major U.S. cities as well as popular tourist attractions, but there are many lesser-known places worth checking out too. With all the different types of landscapes across the country, you'll find such diverse landscapes, from mountain ranges with sunset skies to rolling hills and its vibrant greenery, desert cactus, and beaches filled with clear blue waters. Prices vary greatly depending on location, as major cities like San Francisco and New York are always going to be more expensive options. However there is some good news in terms of hostel prices, especially in New York and San Francisco, where some new and popular hostels have suddenly made these cities more within reach of backpackers. Thankfully, the USA has a wide range of options to suit most tastes, and is still a country that can be travelled enjoyably on a relatively low budget. A genuine travel bargain is New Orleans, which has affordable accommodation as well as fantastic food and drinks that are cheaper than most other large cities, even at some of the fancier places. Miami Beach, and parts of the nearby city of Miami, has really transformed itself into more of a luxury playground in the past two decades, yet there are still some good deals for the backpacking crowd. Washington DC is quite expensive for hotels, and finding cheap restaurants isn't always easy when you are in the main tourist zones. However, nearly all of the museums in the city are free, giving visitors a bit more to spend on food and drinks. Surprisingly, those who can avoid gambling, can actually stretch their funds in amazing ways in Las Vegas, where hotel rooms can be found for as low as USD$15 per night. Montreal isn't necessarily cheap but thanks to some good hostels at reasonable prices and the many free things to do and see, it can be quite affordable for backpackers. Similar to Montreal, Toronto isn't really a cheap city by international standards, but it is an impressive and affordable city worth a visit. Another Canadian city that is still plenty worth a visit even though it's a bit pricey is Vancouver. Hostels have become more expensive in the last couple of years, so keeping your budget down is a challenge.